August 2008 – My Story – ISB and beyond !!! “Live your dream” shouts Rock On and everything about it rocks! Cinematography is top class. The songs and BGM are just fantastic and fit in the movie so well. Direction is too good … how many directors can manage to make such a brilliant movie with a story line that even a kid with a little exposure to Bollywood movies would be able to predict! The maestro and his music! I am not sure if only I feel this way but almost every favorite artist of mine seems to give his/her best performance in venues that are not very famous and that many a times have just a handful of people attending. For example, some of the best concerts of TNS, Sanjay and TMK that I have attended have been at such venues at far flung places or at very small temples with very little publicity. With this feeling providing me confidence, I decided to try attending the TNS concert today at Balavinayagar Temple, Warren Road, Mylapore. With TNS’ voice not in a very co-operative state in the last few concerts of his, I was not sure what to expect at this concert. To add to the discouraging factors were a poor mic system, disturbing noise from the traffic outside and smoke from the yagna earlier in the day that just seemed to linger on in the air. To say TNS sang superbly would be an understatement. It was one of the best concerts I have heard in recent times. The kind of ideas he brought forth, be it in a raga alapana or kalpana swaram, were just unmatched. His fertile imagination seemed to know no boundaries. Whatever ragas he touched seem to turn into gold. The alapanas of hamsadhwani, malahari, shanmukhapriyA and varALi were all outstanding. The crowning glory was the RTP in varALi. There was this feeling of contentment when the concert finally ended past 11:30 PM and I walked back totally soaked in the day’s varALi! Looking forward to the concert of another of my favorite artists – Sanjay Subrahmanyan this Sunday. Sanjay has been giving top notch concerts consistently and I am sure listeners are in for another grand treat this Sunday before he leaves on his US tour. There have been some very good Indian movies in the recent past that have tried to explore topics other than the run-of-the-mill ones. One of the directors who has had the courage to attempt such movies and according to me has been very successful in his attempts is Nishikant Kamath. Nishikant’s last movie Evano Oruvan had a great impact on me but was very loud. Mumbai Meri Jaan on the contrary is so subtle and non preachy and yet manages to convey what it wants so effectively. It explores the lives of six different characters through five separate episodes in the days following the July 2006 serial bomb blasts in the Mumbai local trains that took many innocent lives. The movie has a message for almost everyone – even for some TV news channels that seem to be bothered only about scoops and try to sensationalize news to gain TRPs. Each of the six characters have been portrayed beautifully by the cast. Madhavan and Irfan have so few dialogs to speak but still manage to create such an impact with their acting. The camera work is just too good! Certainly one of the best movies I have watched in recent times and one that I would highly recommend to everyone. Hats off to people like NIshant who dare to make such movies! Played mrudangam today for the violin duet of Sudha R.S. Iyer and Srividya R.S. Iyer at Raga Sudha Hall, Mylapore, Chennai. 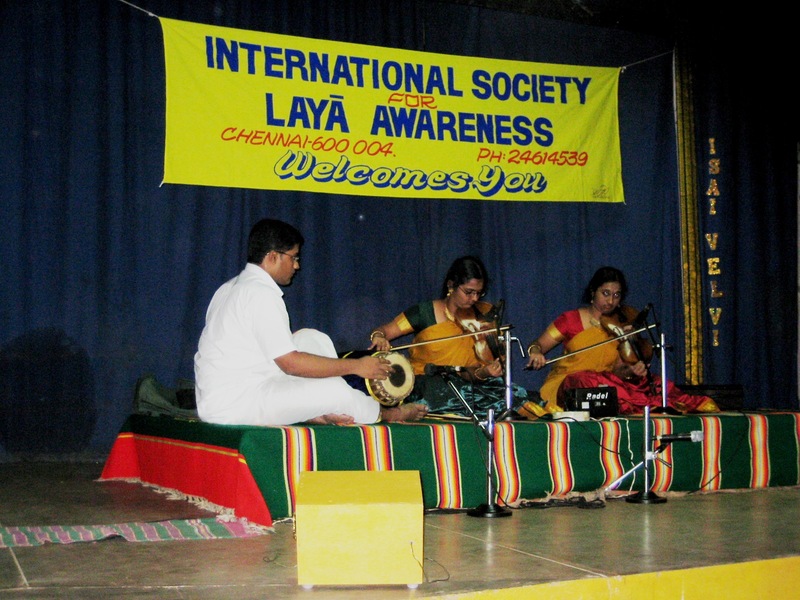 The concert was a part of Isai Velvi 2008 being organized by (Ghatam) Sri V. Suresh’s International Society for Laya Awareness. Tani was for misra cApu tAlam and eDuppu was 3 aksharams after samam. Carnatica Archival Centre for Music & Dance presents a two-day festival dedicated to the great composer Shri. Shyama Sastri. The event is designed as an exposition of the life and times of this vaggeyakara, to gain insight into the lyrical beauty of his compositions and most importantly as a fund raiser to help his descendants, who are in dire need of financial assistance. Dakshinamurthy Auditorium, PS High School, Mylapore, Chennai – 4. 5.30 pm – 9.00 pm: Mini concerts comprised exclusively of Shyama Sastri compositions by Vijay Siva, R. Vedavalli, Suguna Purushottaman & Varadachari (Duet) and Gayathri Venkataraghavan. Accompanists: Lalgudi Vijayalakshmi, Amrita Murali, Manoj Siva, Trivandrum Balaji. We request your generous donations for the Shyama Sastri Family Benevolent Fund. Matrka & YACM organized a 6 day event from 5th Aug to 10 Aug 2008 aptly titled “Svanubhava“. The event comprised many educative sessions like lecture demonstrations, listening sessions, Q&A with artists and concerts and saw many music students including those from Kalakshetra, Govt Music College and the Music Academy participate. As confessed by many of the artists who took the sessions, it was probably for the first time that so many youngsters could be seen together attending an event related to Carnatic Music. It was a feast not only for the ears but for the stomach too with the benevolent Sri N. Murali of Krishna Sweets sponsoring lunch for all participants on all 6 days. With work playing spoilsport, I could attend the sessions only on the last two days and must say that it was a very good experience. The presence of more black hair than gray was a welcome change in itself. It was heartening to see so many students of music come and attend the concerts. Their absence from the concerts that keep happening in the city and their clapping at all kinds of odd places during performances was testimony to the fact that they probably remain stuck to their college schedule and do not venture out that often to hear other artists perform. Some of the questions that were asked by the students were brilliant but I must confess that the answers from some of the artists often left a lot more to be desired. The organizers must be congratulated for conceiving such an idea and organizing an event of this scale specifically for students of Classical Music. They must surely be one satisfied lot at the end of the fest. I do hope this excellent start is followed by many more of such events. The director shouts. The cameraman turns to his left from where he is currently focusing to capture the most important scene of the movie. It is the scene where the towering personality of Kollywood enters the movie. A personality larger than life and one that is so difficult to capture on film that the cameraman really struggles to do justice to the shot. Cameraman runs and shouts after he reaches about 8 miles from the spot “Soopper idea boss … idha modhal la ye sollirukka koodadhu? I am able to capture better from this spot with maximum joom out”. This is how we get the best shot of the movie. A shot that will make every police officer envious …. one that would put even our Captain to shame. It’s the scene that marks the entry of the “Ilaya Thilagam”…. the greatest of the greatest …. our very own superstar Prabhu. Make sure you don’t miss this scene when you watch the movie .. and beware … this scene can’t be watched on thiruttu VCD (note the message in this blog post). You need the vast expanse of a cinema theater screen to even try to capture it in its entirety. It will teach you what dressing UP means. Ilaya Thilagam beats even the legendary police inspector of Thanga Padakkam in this. If you are thinking what crap is all this, then wait ….. the movie is a lot worser. It is not worth wasting your money on. You can see the last 20 minutes of the movie and come to know almost everything about it … and that’s all about it. The rest of the movie just drags on endlessly to the point that I heard some South Indian mothers in North India finished sweater pottufying for their children while watching it. Producer topline, bottomline target ellam meet panna poraaro illayo … cameraman waistline a correct-a capture pannittar, be it for Ilaya Thilagam or for Nayantara. Mind you … it’s no easy job. Enna zoom range irukkanum in the lens to complete this task! Nayantara sizzles, especially in the song “Chaaral chaaral”. I liked this song for more than just that one reason for this is one of the two songs where the picturization does some justice to G.V. Prakash’s decent work as a music director (the other one is “Sollamma”) and because it has been sung so beautifully by Shreya Goshal. “Cinema cinema” is also very good musically and promised to be the perfect entry song for Superstar but the way it has been picturized left a bad taste. The comedy is pathetic at most places. Some scenes of Vadivelu and some dialogs of Santhanam kept my attention in an otherwise boring and dragging movie. Innum evvalavu padathukku thaan ya Vadivelu adi mattum vaangardha paarthe naanga ellam sirikkardhu? To add to the woes are the roles given to people like Livingston, Vaiyapuri etc. Santhana Bharathi is totally wasted in the movie. Pasupathy does full justice to his role and Meena supports him well, though her get-up and dresses are not in line with the financial condition of her family. Usually Superstar grows old as his movie progresses and appears with a lot of white hair towards the end. This was one movie where everyone in the audience grew old instead.